During our trip to Venice, we did a Context Travel walking tour themed around Casanova’s 18th century Venice. Giacomo Girolamo Casanova was an Italian adventurer, author, and womanizer who was born and lived in Venice during the gilded and decadent eighteenth century. Perhaps best known for his daring and amorous exploits, Casanova’s autobiography is considered one of the best sources of European lifestyles and customs of the 18th century. Between the 13th and 17th centuries, Venice had amassed significant power and wealth through trade although its power was rapidly fading by the 18th century as the republic was no longer a major center of international trade. In the 1700’s, or Settecento, Venice became known as a place for leisure and pleasure, with the 18th century being considered the most hedonistic period in Venetian history. This period is often symbolized by gilded palazzos along the Grand Canal, lavish fashions, elaborate parties, elegant cafes, mask-wearing anonymity, and loose morals, but it was also the period that gave birth to great Venetian painters such as Tiepolo, Canaletto, Guardi, and Longhi and musicians such as Antonio Vivaldi. 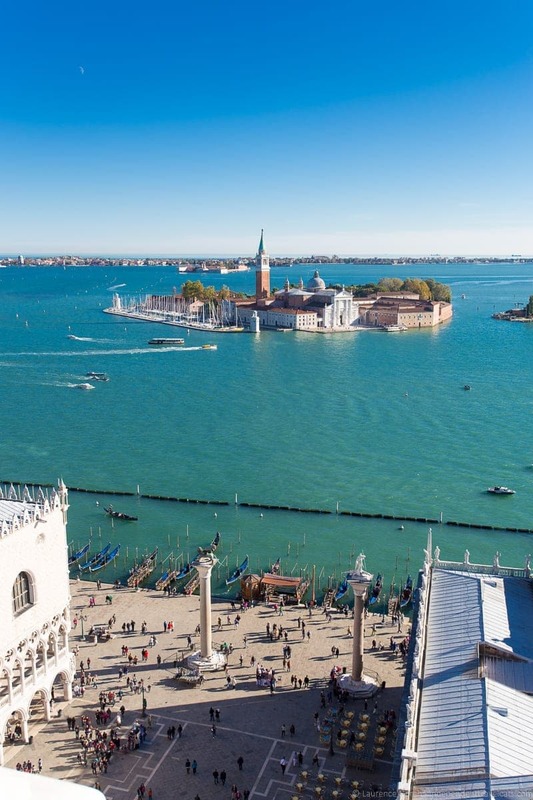 The European Grand Tour also reached its peak in the late 1700’s, and Venice was considered a must-see destination for aristocratic travelers and one of the best places in Europe for gambling, reveling, and having fun with courtesans. Many British travelers planned their travels to Venice to coincide with the most decadent time in Venice: the Venetian Carnival. 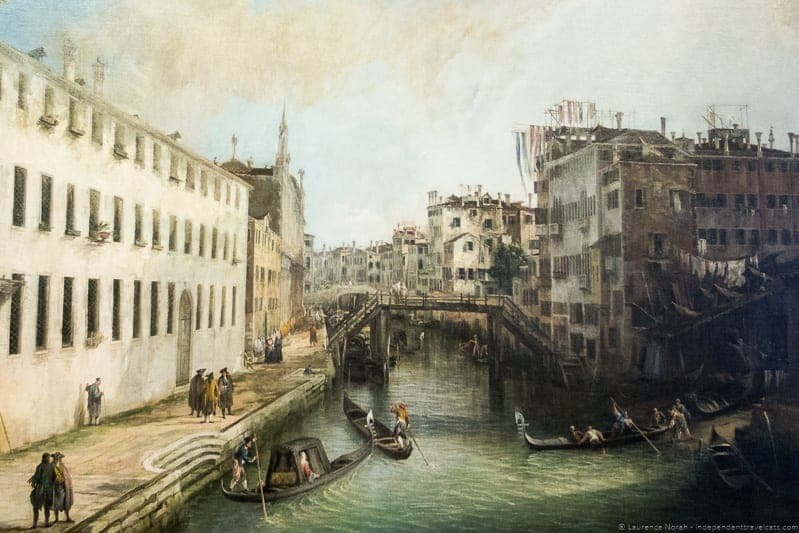 We set off with our Context Travel guide and art historian Susan Steer to learn more about Casanova’s 18th century Venice. We’ll share our tour experience and tell you all you need to know to book this tour yourself (and even receive a 10% discount!). Context Travel is a tour company started in 2003 by life and business partners Paul Bennett and Lani Bevacqu after an interesting experience crossing the Atlantic in a small boat, sailing from New York City to Rome. Context Travel grew rapidly and now offers both private tours and small group tours in over 30 cities worldwide across 5 continents. They focus on very small group tours (and private tours) that provide in-depth knowledge and hands-on experiences with guides who are scholars and experts in their fields of expertise. Most Context guides, or docents, are specialists in the type of tours they lead, whether they be historians, theologians, architects, or chefs. Context Travel is also committed to sustainable tourism and has put considerable efforts into reducing their environmental footprint, controlling the social and economic impact of their programs, and giving back to the cities in which they operate. The company has been well reviewed by a number of travel experts and customers since its debut. What Tours do they Offer? Context Travel offers walking tours in over 30 cities worldwide and the tours focus on a number of topics, such as art, history, ecology, cuisine, literature, wine, history, and architecture. They also provide general orientation tours in most cities and some day excursions. Context Travel also offers family-oriented tours with docents specifically trained in providing tours that are kid-friendly. What Makes Context Travel tours different? There are four main distinctions that set Context Travel apart from many other tour companies. First, the scope of many of the tours is more narrow than a typical group tour (18th century Venice for example) with more focused and in-depth information on a particular subject. The tours are set up to be more of a walking seminar with plenty of opportunity for discussion and to incorporate any related specific interests of the participants as they come up. They are meant to appeal to the “intellectually curious” and scholarly traveler and are definitely geared to those who are truly interested in the subject of a tour rather than just seeing the highlights of a place. Second, the tours are not scripted in the sense that the actual itinerary can shift depending on the interests of the participants and the expertise of the particular tour guide. 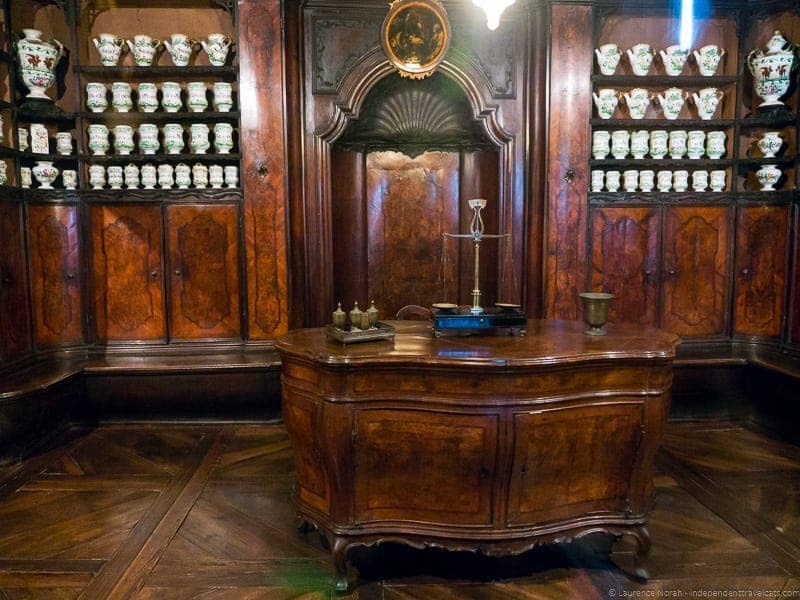 For instance, we were given the option of visiting the Ca’ Rezzonico or the Querini Stampalia Museum on our Casanova tour and we also had the option to stop for coffee or not. Private tours and custom tours are also available for almost all of the offered Context tours which guarantees you a personalized experience. Another point of distinction is that the group sizes are small with a maximum of 6 people allowed on most tours, which makes for a truly small group experience versus many tour companies which limit their small group tours to 10 to 20 people. Finally, the guides used for Context Travel, typically referred to as docents rather than guides, are scholars in their field of expertise and most have a Master’s or doctorate degree and many teach at a local university. So for instance our guide for our Casanova’s Venice walk had a Master’s degree that focused on Venetian art and a PhD focused on Venetian Renaissance painting and altarpieces. Who is the best fit for a Context Travel walking tour? The Context Travel tours are best for those wanting a truly small group tour (or private tour) that will provide an in-depth intellectually stimulating tour given by an expert guide. Their primary customers are curious, educated, and enthusiastic travelers who are specifically looking for an expert-guided tour. These tours may not be the best fit for someone looking for more of a highlights tour or “best of” tour in a city. For example, Context Travel offers several tours of the Louvre museum in Paris, including a “Crash Course” (a highlights tour) but the rest of its Louvre tours all are 2-3 hour tours specifically focused on topics such as Flemish & Dutch paintings, paintings by Italian masters, the history and architecture of the Louvre, and antiquities. Context Tours may also not be the best fit for those on a tight budget as they tend to be a bit higher in price than an average group tour. The reason for the higher price is the small tour sizes (having 20 people on a tour allows a company to be able to charge much less) and for hiring the services of a truly expert guide. I would also not recommend most of the general tours for younger children, who would probably be a better fit for the specifically designed family-oriented tours or a private tour. The cost of a Context Travel walking tour varies depending on the tour content, but group tours (up to 6 persons) generally range from about USD $70 to $100 per person. If you want a private or custom tour, they generally range from USD $250 to $450 for a group of up to 8 persons. For instance, our Casanova’s Venice walking tour is currently priced at $87 per person or $375 for a private tour. NOTE: Many Context Travel tour prices do not include all the entrance fees or transport costs, especially if there is a choice of venues, optional visits, or needed use of a taxi or public transit. In these cases, you will typically be responsible for these costs and these costs will be explicitly mentioned in your tour confirmation email. So for instance, the Casanova’s Venice tour cost does not include the entry fee into either the Ca’ Rezzonico (10 euros/person) or the Querini Stampalia Museum (10 euros/person). How do I make a tour reservation or contact Context Travel? The easiest way to book a tour is online through the Context Travel website. You can also email Context Travel at info@contexttravel.com or call them at their toll-free U.S. phone number +1 800 691-6036 or regular phone number +1 215 392-0303 during normal business hours. If you have already booked a tour and need to contact them outside of business hours, check your email confirmation for their 24-hour emergency phone number. You can also find Context Travel on Twitter @contexttravel and on Facebook. 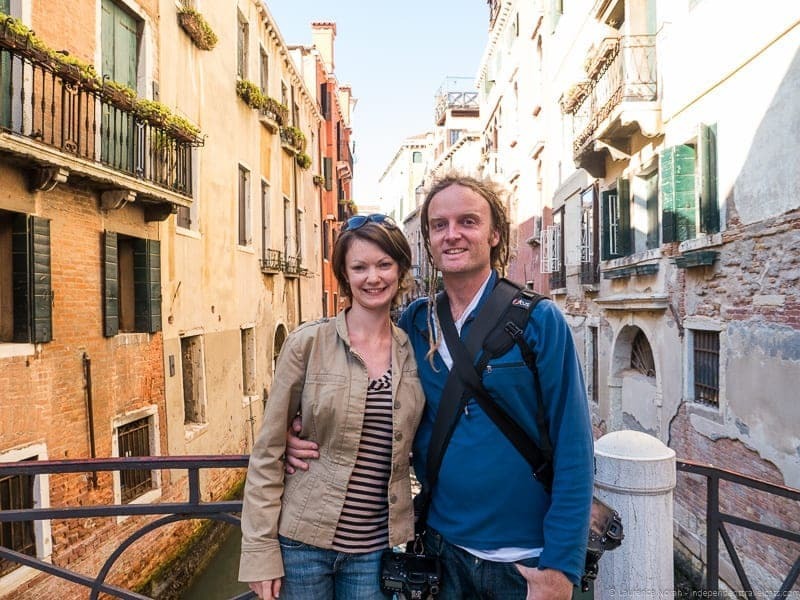 After hearing about Context Travel and their unique approach to walking tours, Laurence and I decided we wanted to work with them on our recent trip to Italy where our travels focused on the Grand Tour era. We are proud to be part of Context Travel’s Deep Traveler network and to serve as ambassadors for this company. Our meeting point was in front of a small cafe on a square in the Dorsoduro area of Venice and we had no trouble locating it as we had actually had a wonderful good value lunch at the Ristoteca Oniga in the same square earlier in the week. Our guide Dr. Susan Steer was already there when we arrived. We asked Susan a bit about her background while we waited for the third person signed up for the tour to arrive. Susan studied Italian and Venetian art at university. She holds a Master’s degree concentrating on Venetian art and a doctorate in the History of Art where she focused on Venetian Renaissance painting and the altarpieces of Bartolomeo Vivarini. In addition to being a guide in Venice, she also teaches art history for an American university. The other guest showed up on time for the tour and Susan provided us with an introduction and a brief explanation of the tour and its focus. The main highlight of this tour was a guided visit to either the Ca’ Rezzonico or the Querini Stampalia Museum and she asked us if any of us had been to either. None of us had been to either so she recommended the Ca’ Rezzonico as that was the one she typically visits and we set off on the tour. We headed along the streets of Venice towards the Grand Canal, and our first major stop which was the Ca’ Rezzonico. Construction of the palazzo was started in 1649 by Filippo Bon, a member of a Venetian patrician family, who employed Baldassarre Longhena as the architect. However, the house would not be fully completed until 1756 after being purchased by the wealthy Rezzonico family. This Baroque palazzo’s marble facade faces the Grand Canal and today houses a museum dedicated to 18th century Venice. 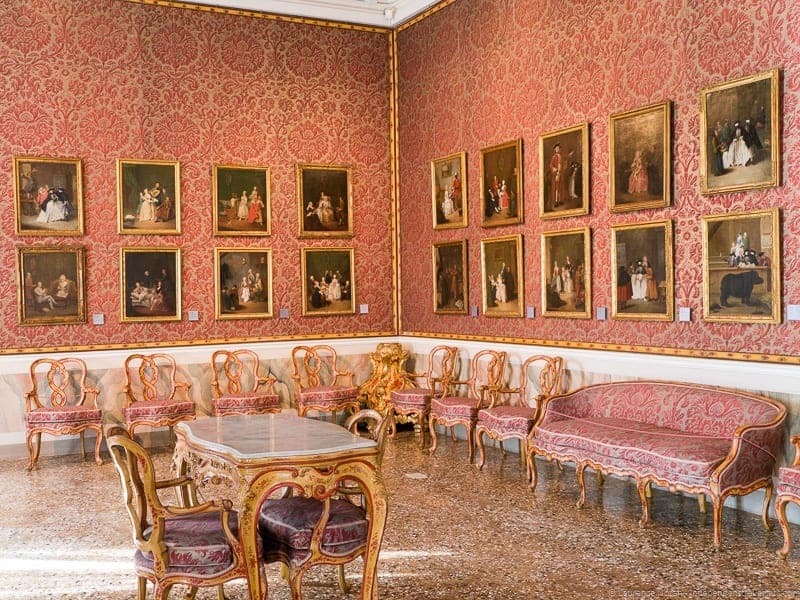 The museum is special in the sense that not only is it an art museum, but it is also an actual residence of the 18th century and much of the art and furniture is displayed in situ or at least in the type of setting (a grand palazzo) for which it was intended. The palace was built at great expense and is sumptuously decorated. You’ll find a marble staircase that leads to gilded ballrooms, frescoed salons painted by Giambattista Tiepolo and other leading artists of the period, and lavishly furnished boudoirs full of 18th century furniture. 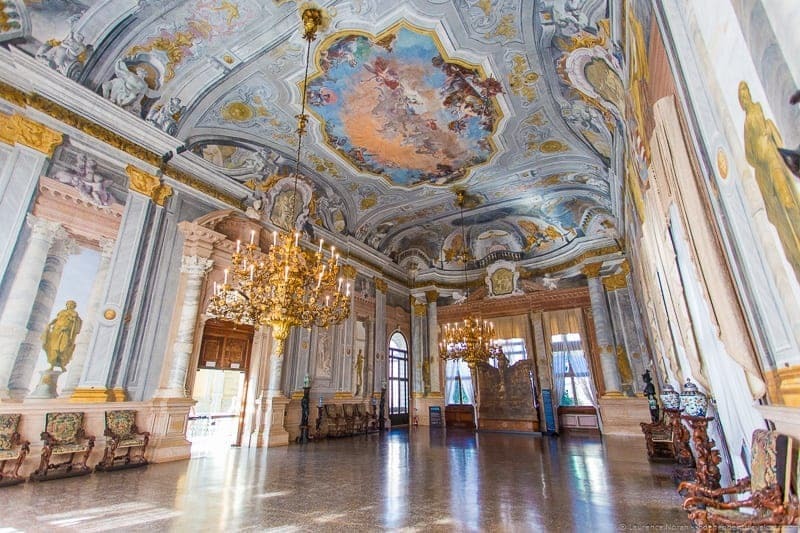 Susan not only shared information and stories about the specific art and furnishings, but she also used the Ca’ Rezzonico and its furnishings to help paint a better picture of what it was like to live in Venice during the hedonistic 18th century, at least among the wealthy citizens. The Rezzonico family for instance were not from Venice, but simply very rich and would buy their way into Venetian society, making strategic marriages, giving large donations, and even seeing a son elected as Pope which you can see reflected in some of the art on display. 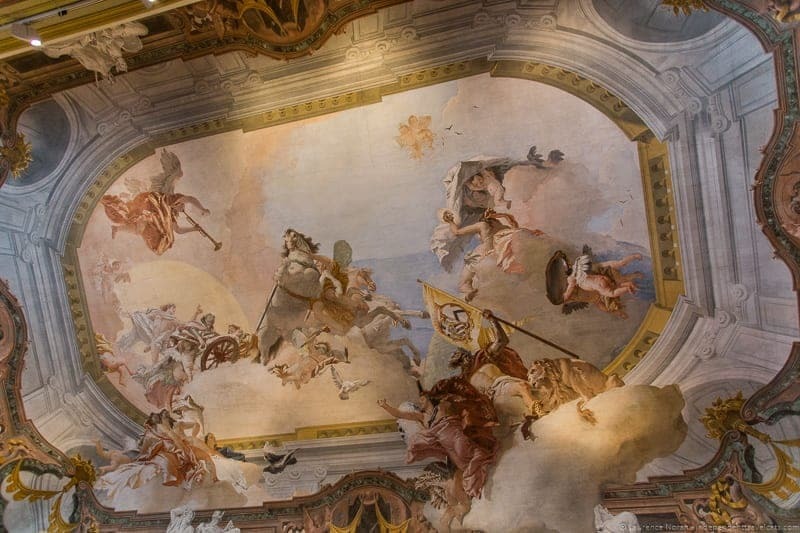 In addition to the Giambattista Tiepolo’s four frescoed ceilings in Ca’ Rezzonico, other highlights include paintings by famous 18th century Venetian painters such as Pietro Longhi, Canaletto, and Francesco Guardi, a collection of Murano glass, and the furnishings from a Venetian antique pharmacy complete with majolica ceramic jars with 18th century remedies. I particularly liked the Venetian landscapes by Canaletto which were much prized by British during the Grand Tour and the paintings of Venetian society life by Gaurdi and Longhi. Susan used these paintings to talk about some of the customs related to gambling, mask wearing, and parties of the 18th century. The next part of the tour took us through many of the back alleys of Venice. Along the way, Susan would point out the area in which Giacomo Casanova was born, which is directly across the canal from the Ca’ Rezzonico. Susan also shared stories of Casanova’s life during our walk. Casanova’s parents were poor actors and he would spend much of his early childhood in the care of his grandmother. However, the social circumstances of his birth and upbringing would not prevent Casanova from being considered one of the most dynamic and interesting men of his age. 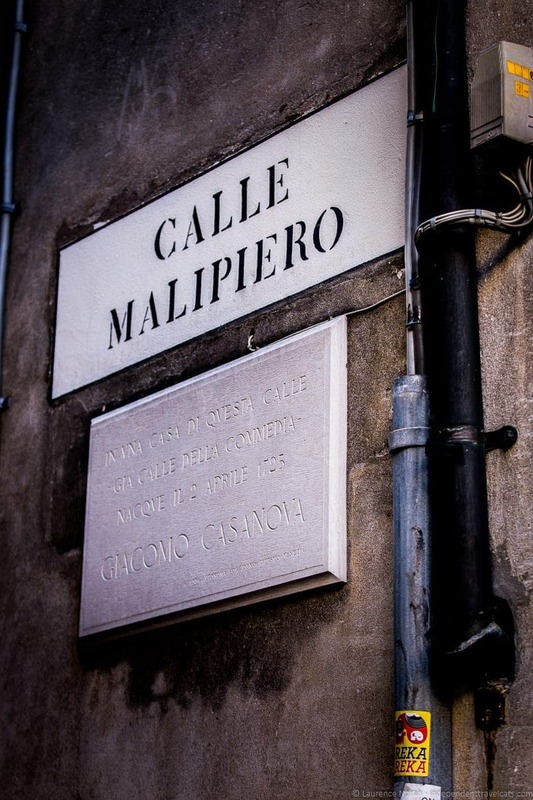 He was born in a small house off of Campo San Samuele, on Calle Malipiero (then called Calle della Commedia), and you’ll find a plaque there dedicated to his birth. In Casanova’s time, he would have navigated dark, narrow, and dank streets. In this area, you’ll also find the San Samuele church (usually closed) where Casanova was baptized and trained as a priest; Casanova’s parents got married here as well. You’ll also find nearby the Palazzo Malipiero in which he lived part of his teenage years after befriending a wealthy state senator. It was here that Casanova would begin his social life and develop his taste for the finer things in life. 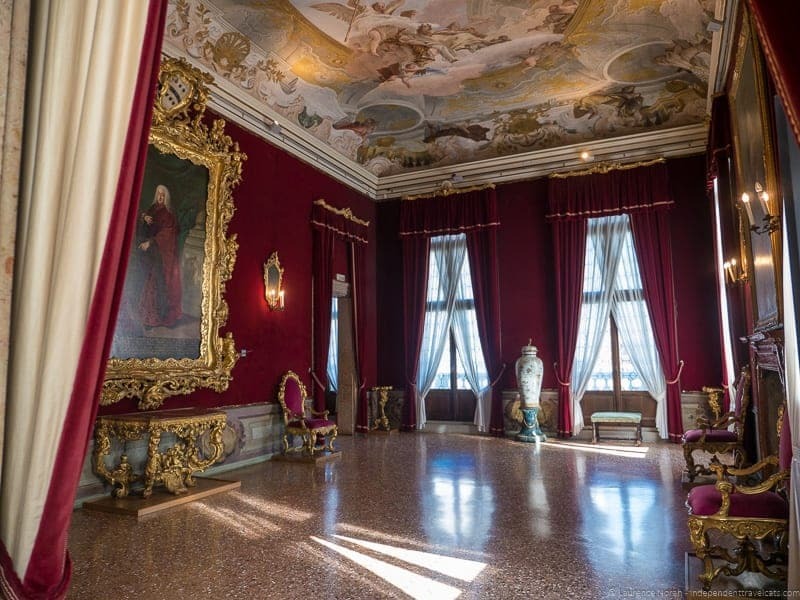 Currently the palace is being used for exhibitions and part of it is apartment rentals so you can actually book to sleep in the same house as Casanova. Casanova while better known now for his gambling, con artist skills, duels, and large number of lovers, also spent time as a church cleric, practiced law, played the violin, worked on spy missions, traveled widely throughout Europe, mixed with European royals, translated the Iliad, and wrote a number of books, plays, and pamphlets on topics ranging from mathematics to science fiction. He was a truly self-made man who lived on his wits and charm, and it is hard to argue with the following statement from his biography which he wrote in 1797 at age 72, “though I am still breathing, I can say vixi (‘I have lived’)”. Casanova’s autobiography Story of My Life (Histoire de ma vie) not only provides remarkable insight into this interesting historical figure but it also serves as one of the best sources available for understanding the 18th century world in which he lived. A recommended read if you are interested in the subject. Along the walk, Susan pointed out art, cafés, churches, mask shops, theaters, and other places that were of interest and also told us stories that were connected to 18th century Venice. We talked of the popular social activities of the time, such as gambling, attending the theater, and parties. 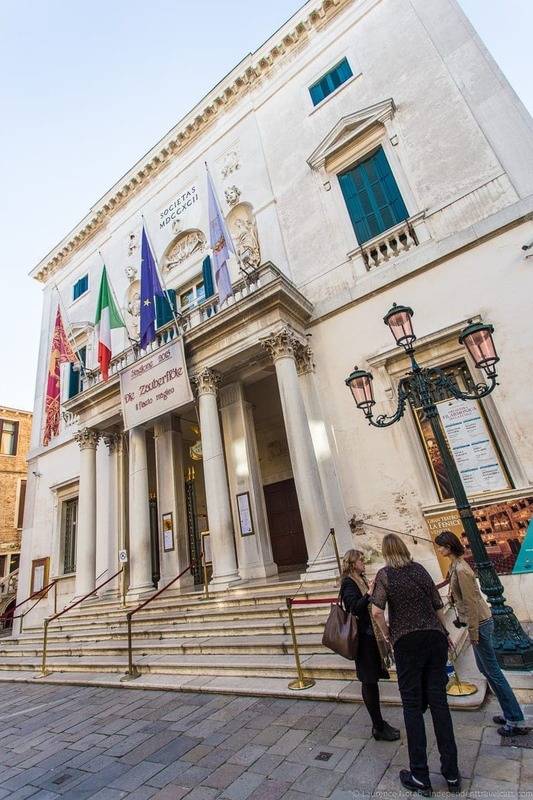 For instance we walked by Teatro La Fenice (“The Phoenix”) which was one of the most popular theaters and opera houses in Europe. It has burnt down twice (1836 and 1996), but was rebuilt and still has performances today. She also pointed out interesting things like a floating vegetable market and the famous fighting bridge called the Ponte dei Pugni, the setting for many fist fights in the 17th century! 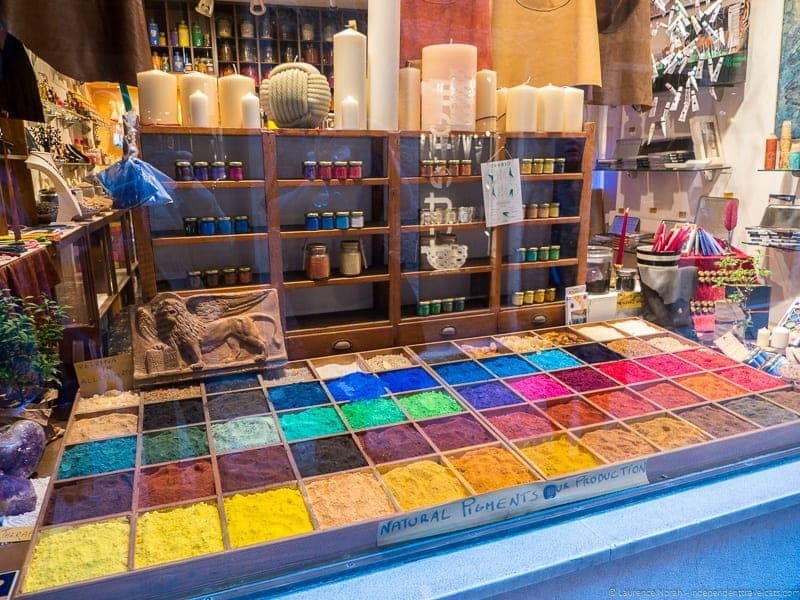 rainbow of artist’s pigments for aspiring painters! Susan also taught us about the various masks that would have been worn by Venetians of the 18th century. 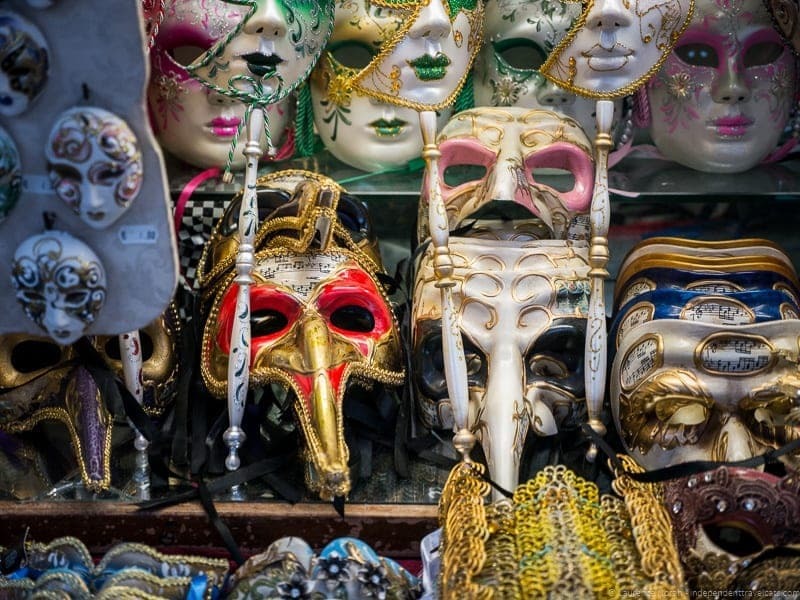 Today these are associated with Carnival, but at the time they were worn more widely by Venetians although the exact origin of mask wearing and its original purpose is not exactly known. It was definitely used as a way in the 18th century to engage in behavior, typically bad, in an anonymous manner, but it was also worn at political assemblies to better assure people felt comfortable casting their ballots as they wished. Susan told us that Casanova would have probably have worn a bauta (or bautta) mask which was one of the most common masks at the time. The bauta mask was at that time typically white and covered the whole face with a projected area around the mouth that allowed wears to eat, drink, and speak without removing the mask. It also served to help disguise the wearer’s voice. The bauta was also typically worn as part of a costume that also include a black cape and a tricorne hat. The moretta is an odd strapless mask worn by women at the time that simulated a black face; women kept it on their faces by keeping a peg or button grasped between their teeth. Doesn’t sound very comfortable! There is also the modern mask with the long beaked nose, the Medico della peste, that was actually inspired by plague doctors who wore it to prevent illness in the 17th century. Modern masks are typically more colorful, varied, and ornate than masks worn during the 18th century. 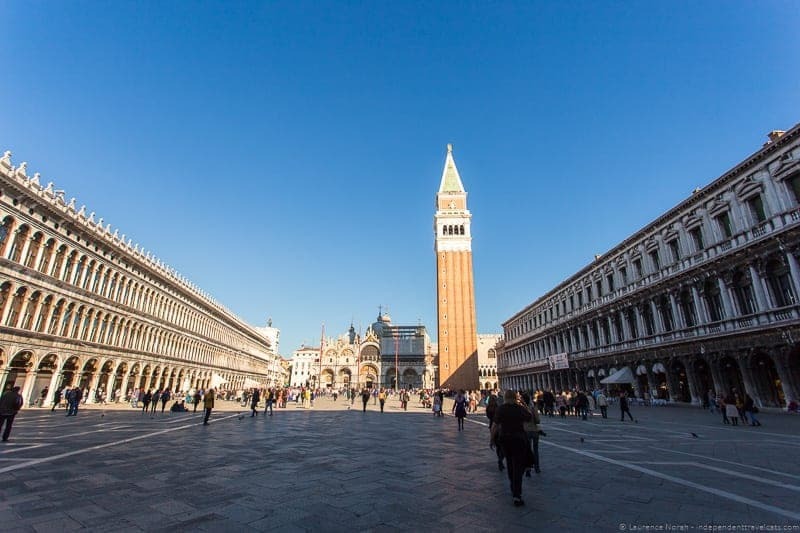 We entered St. Mark’s Square and Susan told us that the area has been a popular place to gather and meet for centuries, and in the 18th century it became very popular for people, especially men to meet and talk in cafés. Coffeehouses first began appearing in Europe in the 17th century, with one of the first cafés being in Venice. Today you can still find some of the oldest coffeehouses in Europe in Venice, including three 18th century cafés around St. Mark’s Square. We walked by Caffè Florian which opened in 1720, Caffé Lavena which opened in 1750, and Gran Caffè Quadri which first opened in 1775. Coffeehouses throughout the 18th century were meeting places for artists, intellectuals, and famous figures and famous patrons of these Venetian cafes included Marcel Proust, Charles Dickens, Alexandre Dumas, Lord Byron, and Richard Wagner. Giovanni Giacomo Casanova was a known patron of Caffè Florian, considered the oldest extant cafe in Europe and one of the most famous. It is said that Casanova used the Caffè Florian as a place to find women. Today, inside the Caffè Florian, you’ll find paintings, wood carvings, high ornate mirrors, and red fabric covered booths and outside you’ll often find an orchestra playing. e had visited Caffè Florian earlier in the week on the morning of our wedding day in Venice as you may notice in the photos below. All these cafés are quite beautiful and retain some of their 18th century ambiance. However, these cafes are pretty expensive but you can save money by drinking your coffee at the bar rather than at a table or booth. See our article about coffee in Italy for more tips! As we continued our walk through the large open space of St. Mark’s Square past the Caffè Florian, the Doge’s Palace came into view. 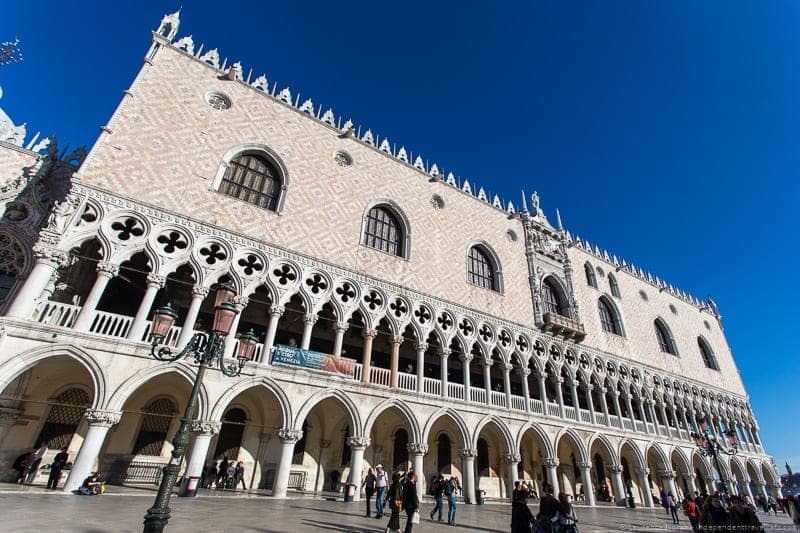 Built in Venetian Gothic style, the Doge’s Palace, or Palazzo Ducale, served as the residence of the Doge who was the ruler of the Republic of Venice as well as the center of the Venetian government. 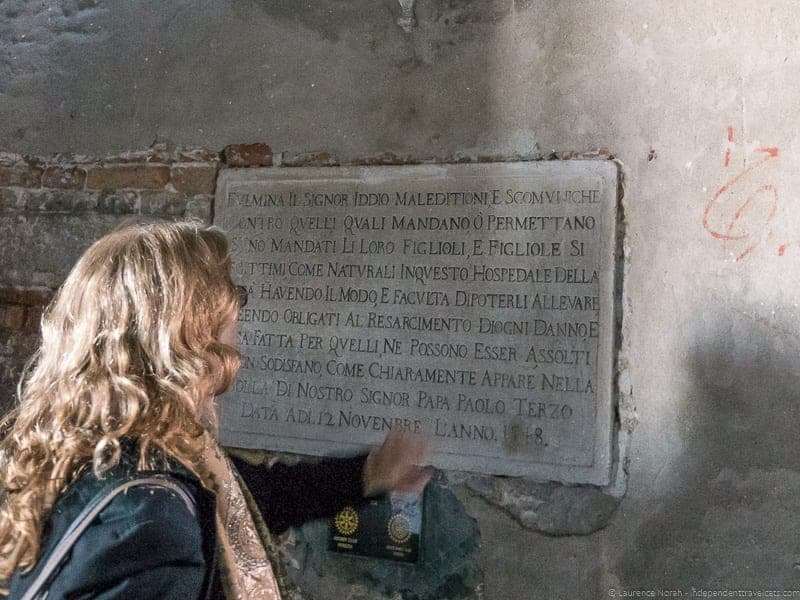 Susan explained that it was here that Casanova was held as a prisoner in 1755 and it was also here that he would make his famous escape in 1756. Susan explained that Casanova was sentenced to prison without a trial, without even knowing what he was imprisoned for, and he didn’t know for how long he would be kept. His actual sentence was for 5 years for having forbidden books in his possession related to witchcraft and magic. 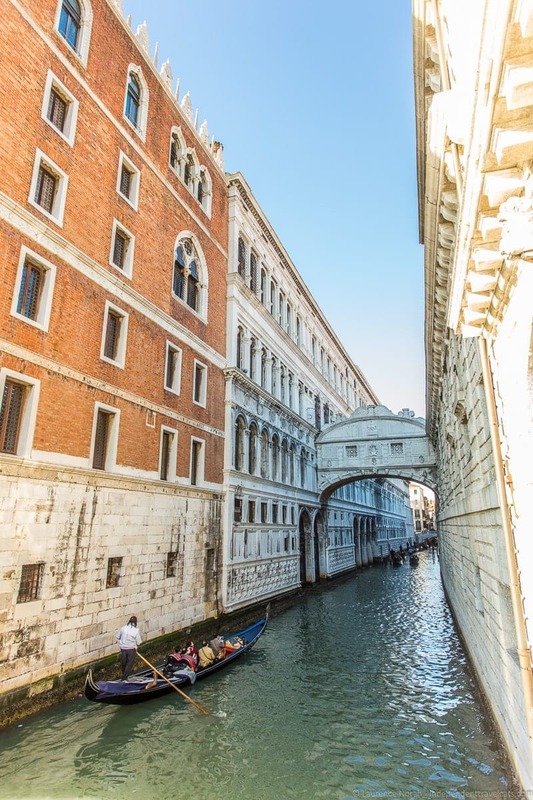 Most people know that there were prisons accessible from the Doge’s Palace through the famous Bridge of Sighs. However, there are also older prisons cells within the Doge’s Palace itself and this is where Casanova was held in one of seven cells on the top floor of the east wing of the Doge’s palace which were reserved for political prisoners and prisoners of higher status. These prison cells within the palace were directly positioned under a roof, made of lead slabs, and were known as the Piombi. Casanova writes about the misery of his confinement and of the poor heating conditions although he later uses his connections with Count Bragadin to get access to better blankets, books, and other comforts. Casanova was not content to serve out his sentence and decided to escape after only several months of confinement. It is unknown how exactly he escaped, although we have what Casanova wrote in 1787 in Story of My Flight, where he describes a daring and exciting escape that involved a renegade priest, making a hole, running across the roof of the Doge’s Palace in the fog, climbing down a rope made out of a bed sheet, breaking into the inner chambers of the palace, and then strolling out the Porta della Carta, which was the large ceremonial entrance to the palace. Casanova would then escape from the island by gondola and flee to Paris. His daring story of escape became a very popular one of the time, although some skeptics believe that it is more likely that he simply bribed guards to let him escape. Whether true or an exaggerated tale, Casanova is the most famous prisoner to have escaped (though not the only Susan told us) from the prison at the Doge’s Palace. We then turned the corner and walked along the beautiful lagoon past the famous Bridge of Sighs which leads to the so-called New Prisons. Susan talked to us about the circumstances of Casanova’s lovers, who ranged from milk maids to nuns to noble women. Casanova would affect the lives of a number of women around Europe, leaving some women turned out of their houses with ruined reputations and/or unwanted pregnancies. For instance, one of Casanova’s early loves was Caterina Capretta, an innocent 14-year-old women from a Venetian family, who would become pregnant by Casanova and sent by her father to the convent of Santa Maria degli Angeli in Murano. Here Caterina would suffer a miscarriage. Clearly Casanova greatly regretted ruining this young woman’s life as during this period he would also start a new relationship with another nun, known as M.M. in his book, in the nearby convent of Santa Chiara. However, things in 18th century Venice weren’t all terrible for fallen women and orphaned babies. Young Venetian mothers could anonymously take their young babies to the portico of the Ospedale della Pietà, which was a convent, orphanage, and musical school, and leave the unwanted infant in a scaffetta, a sort of revolving drawer in the wall. Babies left here would be taken in, fed, and educated. This institution, as well as other charitable social institutions in Venice, was funded by both public and private monies. The Ospedale della Pietà would sometimes be taken advantage of by families who could actually support their own children, and in 1548 a stone was placed in the wall of the church that can still be seen today which warns that anyone who leaves a child in which they have the means and ability to bring up will be cursed and if found out, forced to pay back all expenses unless they make atonement. Boys left here were educated until age 10 and then they would be sent out to learn a trade and become apprentices. The girls would also be educated to learn a trade within the school, and some would be able to make a good marriage match and some would stay on within the convent. An interesting aspect of the Ospedale della Pietà is that in addition to having a long history of charitable works going back to 1346, it also served as the highest-ranking school of music in the eighteenth century. All girls taken in were expected to learn to sing and/or play a musical instrument and would sing in church concerts and such, and the best would serve in the orchestra. One of the most famous musical teachers in the 18th century was none other than Antonio Vivaldi who was in addition to being a violinist and composer, an ordained priest. Vivaldi would teach music at the Ospedale della Pietà orphanage for over 30 years and here he would compose many of his famous works. Venetians, as well as travelers, would come to the Ospedale della Pietà to hear the church chorals and concerts and they were well-praised. Today, concerts composed by Vivaldi can still be heard in venues around Venice, including at the Santa Maria della Visitazione, also know as the Santa Maria della Pietà. This church was built by the Ospedale della Pietà in the mid 1700s adjacent to the previous church to serve as both a church and auditorium. The original building in which Vivaldi gave his music lessons is now the Metropole Hotel. The Ospedale della Pietà still functions today as a childcare and adoption agency. Today, one can tour the church (three paintings by Giovanni Battista Tiepolo and a beautiful altarpiece) and visit the Piccolo Museo della Pietà which presents exhibits related to the orphanage, the music school, and Vivaldi, including hand-written musical scores penned by Vivaldi. We didn’t walk here but nearby (about a 10 minute walk) along the lagoon is the former palace owned by Marco Dandolo, now the Hotel Monaco & Grand Canal, who in 1623 opened part of his palace as the notorious Ridotto casino. The Ridotto is often considered the first public casino in Europe and it was here that Casanova gambled and mingled with the Venetian aristocracy until it closed in 1774. Both Pietro Longhi and Francesco Guardi painted scenes of the masked aristocracy gambling and partying in this famous casino, including a couple of paintings we saw at Ca’ Rezzonico earlier on the tour. 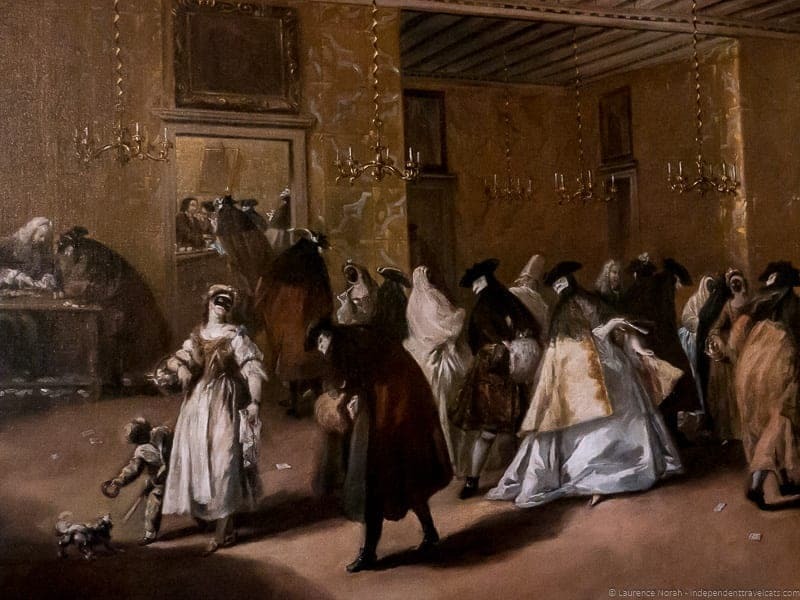 In the painting below notice the masks worn at the casino in the Guardi painting below. Casanova would have likely worn the white bauta mask, black cape, and hat as seen on many of the men below. For those interested in what happened after this lavish century of reveling and gambling, you’ll likely not be too surprised to learn that the Republic of Venice came to a sudden end in 1797 after being conquered by Napoleon. The republic with over 1,000 years of history was at this point too poor and too militarily weak to put up a proper fight against the stronger empires and kingdoms of Europe. Much like Casanova who died in 1798, the Republic sure went out with a bang of hedonistic glory! There you have it, a trip through 18th century Venice in 3 hours! We were out of time, but Susan still invited to accompany us back to Caffè Florian if we would like to have a coffee and discuss anything we’d seen on the tour. Many of the Context Travel Casanova’ s Venice end with a coffee at the Caffè Florian or one of the other cafés if guests would like to do so. Unfortunately, we had a train to catch and were not able to stay to have coffee although we would have loved to have done so. 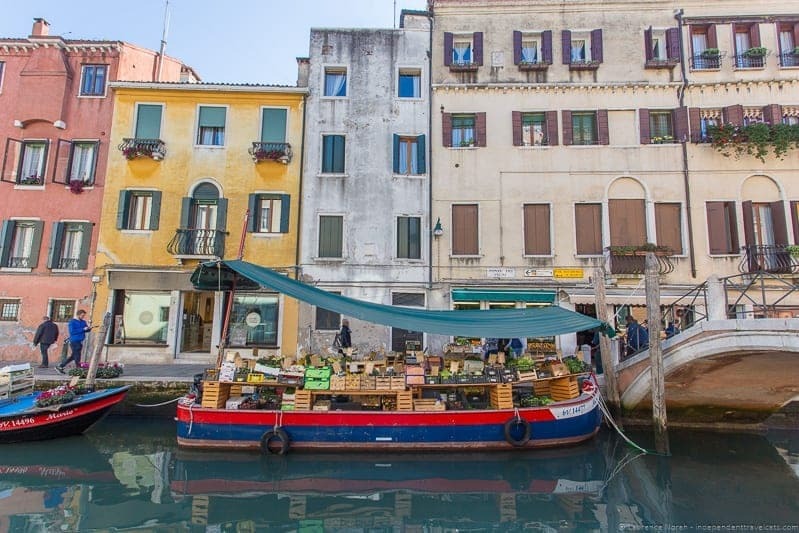 If you are still hungry for 18th century sites in Venice after this tour, Susan is happy to suggest other 18th century related sites you can visit during your time in Venice. Laurence and I both really enjoyed our first Context Travel tour! We enjoyed learning about the exploits of Casanova and the history of Venice during the 18th century, which was a great fit to our Grand Tour themed trip through Europe. I would highly recommend a visit to the Ca’ Rezzonico to anyone looking for a uncrowded art museum in Venice, whether you take this tour or not. Our guide Susan was very knowledgeable and friendly and was able to provide us with lots of interesting information and stories along the tour. 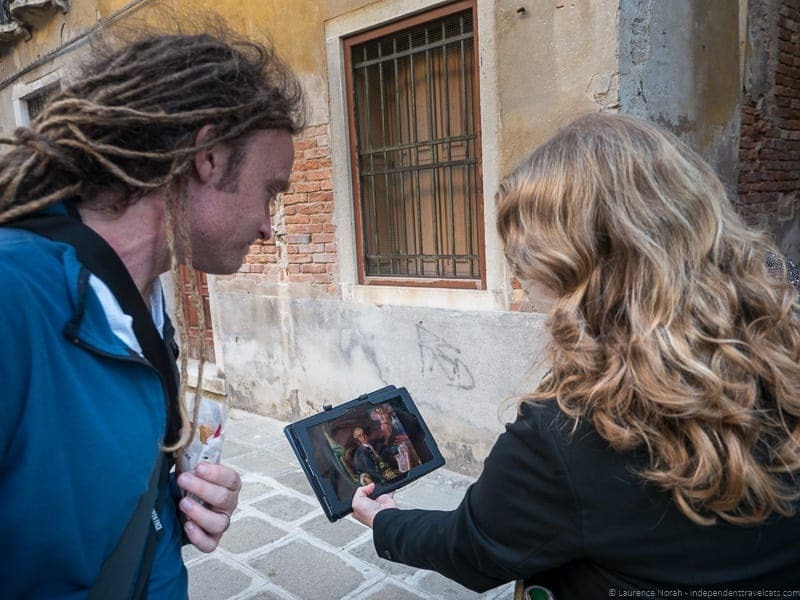 She was also able to answer our questions as they came up during the tour and also provide local recommendations for cafes, stores, and restaurants as we walked through the alleys of Venice. Our one criticism is that we both wished the tour was a bit longer as we would have loved to have spent a little more time with Susan and had more time to stay for coffee, although I think 3 hours may be enough for most travelers. This particular tour was quite art-focused, especially the part in the Ca’ Rezzonico, partially due to Susan’s expertise which is in art history. She explained that each docent gives a slightly different tour, with some more focused on history, art, or architecture depending on the guide’s expertise and interests of the participants. It should be noted that this is not a tour focused on Casanova’s life, so don’t expect a tour filled with Casanova’s favorite places (many of which are long gone) and tales of his amorous exploits. 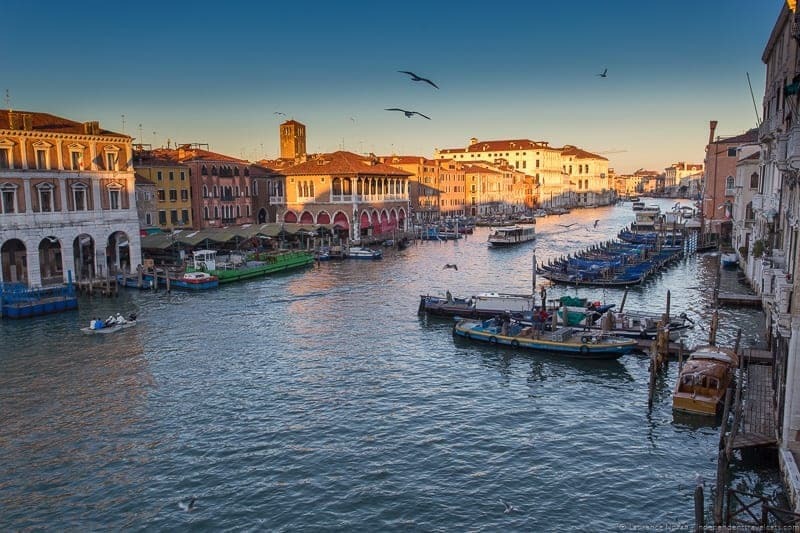 Instead, it is a tour focused on the art, history, and social customs of 18th century Venice with anecdotes of Casanova used to help make it come alive. Do you think you’d enjoy a Context Travel tour of Casanova’s Venice? Have you taken a tour with Context Travel? As always, feel free to comment and we’re happy to answer any questions about our tour. Also for those interested in a walking tour with Context Travel, don’t forget to use the discount link provided earlier in the post to receive a 10% discount! The trip you have made to Venice is perfectly explained here in this article and while reading this I felt that I was there. I appreciate the writing quality of this author and thanks for sharing the pictures too. Keep your great work and keep sharing more like this. 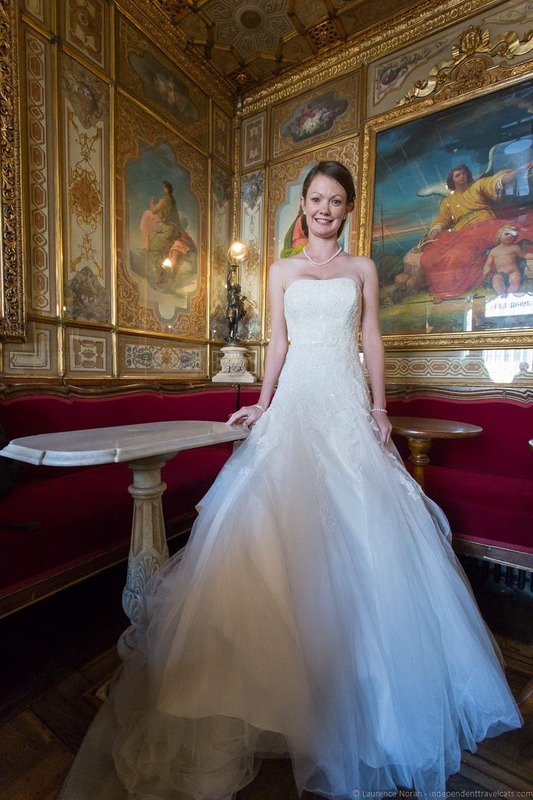 Your wedding dress is stunning and what an amazing venue for a wedding! Your photos are all so pretty too. Jessica, How fun to explore Venice and have such amazing weather and learn all the sordid secrets of the city. It sounds both romantic and fun! Yes, it is great to be able to get a more in-depth look into a city in addition to seeing all the main tourist sites. It was also a good tour that enriched our Grand Tour era theme of our month traveling in Italy. I went to Venice many years ago as part of a student tour. I didn’t get a lot of history insights due to the nature of the trip. I would love to go back and retrace the city based on its famous personalities. Amazing photos by the way. Venice is an amazing city. We rented a house when we were there.